Equipment management and proactive customer service are upgraded with this system. Producers using John Deere's new JDLink telematics system have real time access to information about their machines in the field, which gives them an edge in productivity, maintenance and efficiency. Advanced communications, data collection, GPS and other technologies are melded into the JDLink system which gives owners an instant update on machine location, hours, current operation and a host of other options. Available as JDLink Select and JDLink Ultimate the new system is available for 2011. JD Link telematics allows real time alerts and other information for John Deere machines deployed in the field. Information from the system is available on a Web site, or sent via e-mail or text message. 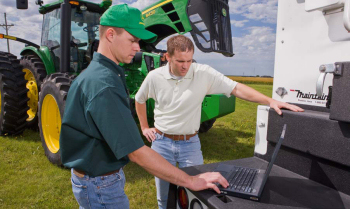 As a part of a 2011 special promotion, JDLink Ultimate will be in installed on all new 2011 8R Series tractors with one year of complimentary service.